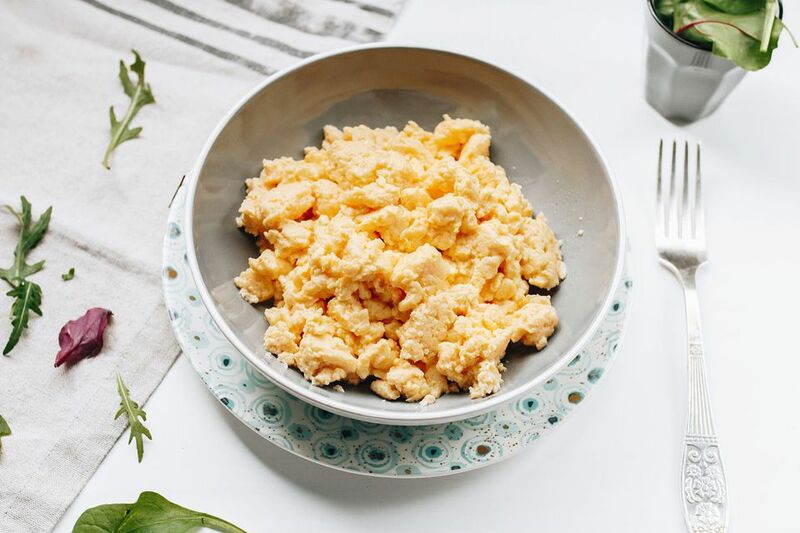 The key to making perfect scrambled eggs is whisking the eggs thoroughly and vigorously before cooking them. Whisking incorporates air, which produces fluffier scrambled eggs, and fluffier eggs are always your end goal. Another professional tip is to turn off the heat before the eggs are all the way cooked. This helps prevent overcooking, which is a common problem with scrambled eggs. You don't want your scrambled eggs to be brown on the bottom. Once that happens, you're working with dry, rubbery eggs. The important thing to remember with scrambled eggs is that they'll continue cooking for a few moments after you transfer them to the plate. This phenomenon, known as residual or "carry-over" cooking, means that you actually want to transfer the eggs to the plate when they're slightly softer than the way you ultimately want them. They'll firm up all on their own. This technique is a lot like the first steps in making an omelet. The difference is that at the very end, you gently break up the eggs, leaving the curds larger and fluffier. Heat a heavy-bottomed, nonstick sauté pan over medium-low heat. Add the butter and let it melt. Add the milk to the eggs and season to taste with salt and white pepper. With your whisk, whisk the eggs like crazy. You're going to want to work up a sweat. If you're not up for that, you can use an electric beater or stand mixer with the whisk attachment. Whatever device you use, you're trying to beat as much air as possible into the eggs. Turn off the heat and continue gently stirring and turning the egg until all the uncooked parts become firm. Don't break up the egg, though. Try to keep the curds as large as possible. If you're adding any other ingredients, now's the time to do it. Whisking eggs thoroughly and vigorously before cooking them incorporates air, which produces fluffier scrambled eggs. Turn off the heat before the eggs are all the way cooked. This helps prevent overcooking, which is a common problem with scrambled eggs. Additional ingredients, especially ones with a lot of moisture in them like tomatoes or onions, can throw off the timing, and your eggs can come out watery. To prevent this, sauté those items separately to cook off the water before adding them to your eggs. Make it easy on yourself and cook your eggs in a nonstick sauté pan. Use a heat-resistant silicone spatula. You need it to be heat resistant so that it doesn't melt and made of silicone so that it doesn't scratch the pan.